Once again this year, HEC Montréal will be fielding one of the six teams at the semi-finals of the Global Business Challenge, organized by the National University of Singapore (NUS). The team of Nahid Yeasmin Choudhury, Véronique Fraisse-Hergott, Anca Ivanov and Shahinaze Hachem will be heading to Singapore to defend the School’s colours on Friday, April 3. “We are very proud to be representing HEC Montréal at this international competition. It will be an exceptional experience in terms of learning and teamwork, a chance to improve our strategy, marketing and finance skills and to work together even more closely. With our team spirit and each one’s strengths, we managed to put together a cohesive business plan that took us through to the semi-finals,” explains Anca Ivanov. To prepare for this next step in Cerebration 2009, the students are counting on the support and advice of their two coaches, Marketing Professor Yannik St-James and International Business Professor Ari Van Assche. The students know that this semi-final stage will be very tough, but they can be confident that they are up to the challenge. HEC Montréal is the only Canadian school to have made it through the first three stages, although many Canadian universities were in the running. The students, who will be working on the Best World International business plan, will be up against teams from five other universities: NYU Stern, The Chinese University of Hong Kong (School of Business), the Indian Institute of Technology of Mumbai (SJM School of Management), Duke University’s Fuqua School of Business and the Indian School of Business. The three best teams will qualify for the finals, to be held the next day. 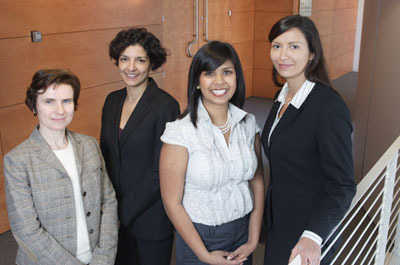 The HEC Montréal team came out on top in this competition last year. This is the third time the School has made it into the semi-finals in four years.